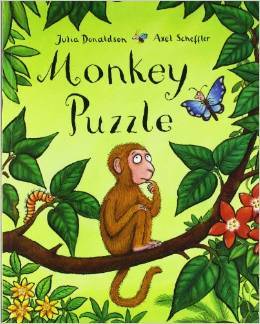 In this favorite from the author of The Gruffalo, a butterfly helps a lost monkey to find his mother. The butterfly misinterprets the monkey’s description of his mother and leads the monkey to several other animals before finally locating his mother. 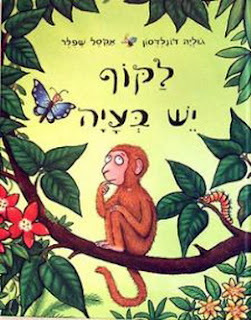 In both the English and Hebrew versions, the language rhymes well and has the repetitiveness that preschoolers enjoy. The story also hits the mark with preschool humor: our lil guy thinks that it is hysterical that the butterfly keeps getting it wrong and leading the poor monkey to animals that are clearly not his mother. For those who like stories with some cleverness, there is a very valid reason for the well-meaning butterfly’s mistakes. Both the English and Hebrew versions of this book are readily available in Israel and online. Follow Liane's board Books by Julia Donaldson (ג'וליה דונלדסון) on Pinterest.